Marie Curie is the only woman on this list. It is a sad reminder that until recently it was very challenging for female scientists to be taken as seriously as their male counterparts. Thankfully, this is changing and women have key roles in all areas of science today. Curie was the first woman to win a Nobel Prize. She was the first person (and only woman) to have won two Nobel Prizes, and she remains the only person to have won a Nobel Prize in two different disciplines of science: physics and chemistry. The majority of Curie’s work was based on the study of radioactive materials. At the time, very little was known about radioactivity. Curie discovered and isolated many new radioactive elements including the element radium. Upon its discovery, radium was a revelation. It seemed to defy the laws of physics itself, seemingly giving out more and more energy, causing many physicists to question the accepted laws as they were known. 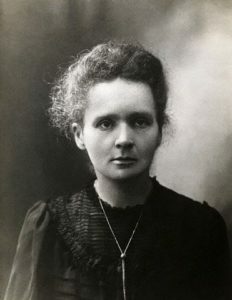 During World War One, Curie used her knowledge of radioactivity to pioneer new treatments using radiation, including the sterilisation of wounds. It is a sad irony that Curie was unaware of the dangers that radiation posed. It was her exposure to radiation that ultimately led to her death. Her longtime exposure to radiation caused aplastic anaemia. So many of Curie’s advances in the understanding of radiation are utilised today, from medicine to electricity.